Hosted by Kathryn from Book Date, “It’s Monday! What Are You Reading?” is a weekly event to share what we’ve read in the past week and what we hope to read, plus whatever else comes to mind. Here is what I read the week ending 22 April 2019. To learn more about each book, click on the book cover! The last two weeks are a blur. I know I was really sick for a day, so sick that all I did was lay in bed with my eyes closed because anything else required too much effort. I know that it took me a lot longer to recover from that brutal sinus infection than I ever thought possible – because I am still recovering. I know that I lost both of the weekends to dance competitions. I feel like I could have read more than I did, but I’ll be damned if I could do much more than play Homescapes the last few weeks. I did not have the mental, physical, or emotional capacity to read more than a few pages at a time. I am improving and may be back to my normal self one of these days. The post It’s Monday! What Are You Reading? – 22 April 2019 appeared first on That's What She Read. We made it through the worst of the competition season and have one more competition to go before the regional season finishes. I can’t say that we came out unscathed, as I developed a severe sinus infection midway through the last two weeks that made me want to hide in the hotel room rather than socialize and watch dance all day. There was drama, as there always is, some tears of frustration, and more awards and trophies than one would think possible. The team is having an excellent year, as their hard work and dedication shows on the stage and off. Now, we have two glorious weekends without the need to pack, rush around, or toss and turn in an unfamiliar hotel bed. Holly even had a whole week without dance classes. That was probably my favorite thing ever. No need to rush around in the evenings. Rather, I got the chance to slowly dig out of the mess of the house and the long list of chores that I was forced to neglect while Holly and I were busy with dance. It was a slow recovery, but I think I turned a corner and will go into the next week feeling pretty well caught up. Even work seems to have taken a turn for the better. Again, it was a long slog to catch up on everything that I owed people, but I was able to cross the last item off that list on Friday. This means I get a full week to work ahead on things and start a project or two I have been wanting to tackle. I don’t feel like I am completely out of the woods quite yet. The past few months have been so hectic that I would be a fool to think those days are totally behind me. However, I feel like I have breathing room for the first time since November, and that is a good thing. It seems that Winter finally decided to cede to Spring as well, but not without one last blast to remind us that she will be back all too soon. Last Sunday’s blizzard was not fun, especially as it caught us all unaware, without proper clothing or a scraper in the car to clear the windows. Yet, by the end of the week, the sun made an appearance for the first time in weeks and temperatures rose high enough to turn off the furnace and open the windows. Winter is still my favorite season, but I will admit to enjoying the feel of warmth on my skin. Speaking of, I am off to enjoy the sun and warmth by doing nothing – because I can. I hope everyone has a wonderful Sunday, celebrating however you see fit. The post Sunday Reflections – 21 April 2019 appeared first on That's What She Read. The post While You Sleep is a nope appeared first on That's What She Read. Hosted by Kathryn from Book Date, “It’s Monday! What Are You Reading?” is a weekly event to share what we’ve read in the past week and what we hope to read, plus whatever else comes to mind. Here is what I read the week ending 8 April 2019. To learn more about each book, click on the book cover! There wasn’t much reading done this past week because my brain was mush at the end of each night. In fact, I think I developed tendonitis in my left wrist from all my time spent using the same two hot-key Excel shortcuts for ten hours each day all week long. This week will be better. I need to make sure of that. The post It’s Monday! What Are You Reading? – 8 April 2019 appeared first on That's What She Read. 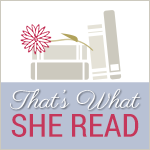 The post Sunday Reflections – 7 April 2019 appeared first on That's What She Read. The post No readathon for me appeared first on That's What She Read. The problem with not reviewing books right after finishing them is that some books have no lasting power. You don’t remember specifics and have nothing but impressions that also fade over time. Plot details go missing. While you can jog your memory by reading other reviews and the synopsis, you risk letting someone else’s opinion influence your own. Such is the case with Woman 99. I read it approximately two months ago. I know I enjoyed reading it because I know it did not take me long to read. I remember the main plot points of the story. I have impressions of certain scenes that struck me as well-written and or beautifully descriptive. Unfortunately, when I go to describe it, two months after finishing it, I am ambivalent about the novel. What sticks with me most is a lingering question about the story’s purpose. We know that in the past asylums were horrible places for the mentally ill. We know women had few rights at the turn of the century and were at the mercy of the men in their lives. We know men admitted women for a myriad of reasons, including using it as a convenient method to get rid of a troublesome wife/sister/daughter. Woman 99 tells us nothing new about any of that. Neither is Woman 99 a true story. The main character uses Nellie Bly as her inspiration, but it is not about Ms. Bly’s actual experiences going undercover in an insane asylum. Instead, it is an imagined story of what it might be like for someone else to infiltrate a mental institution. There was an asylum in Napa at the turn of the century, and some of the characters have a loose connection to real-life people from the area. However, the story remains purely fictional. I now circle back to my initial comment about the purpose of Woman 99. Is it to entertain? Is it to educate? It did amuse me, but that lasted as long as it took me to finish reading it. I cannot even say I would recommend it to others because there are much better books out there that are more worthy of someone’s precious time. It did not educate me because there was little within its pages that I did not already know. It is not escapist literature; mental illness and how we treat it within society and medically are such hot button items these days that it is a timely book regardless of the historical setting. All this leads me to conclude that Woman 99 is a decent book but one that is ultimately forgettable. While there is adequate development of the characters, none are truly memorable. There is nothing earth-shattering within its pages, nothing that makes it a book which entices you to drop everything and read. It is a fast-paced book, which may be its saving grace, in that the story does not take long to develop or move towards its conclusion. There are one or two mild surprises with the plot and characters, but mostly it is a simple story that will get lost in the shuffle of the dozens of other books you will read throughout the year. The post Woman 99 brings nothing new to the table appeared first on That's What She Read. The post My son was right appeared first on That's What She Read. The post It’s Monday! What Are You Reading? – 1 April 2019 appeared first on That's What She Read. The post Sunday Reflections – 31 March 2019 appeared first on That's What She Read.